Imagine you are working on a project with a large group of people, all with different personalities and responsibilities. Your group was just informed that something important to the progress of the project went terribly wrong. Some people in the group start to panic, which causes other people to panic. There is no defined leader for this group project but you tend to take the lead during stressful times, so you quickly step up to the plate. You know that to get this project back on track, you first need to calm everyone down so that they can refocus on the tasks at hand. Now try to imagine that instead of people, you and your group are large molecules composed of long chains of amino acids, a.k.a. proteins, and the group project is maintaining the life of your cell. Proteins make up many important biological structures (such as hair, nails, and connective tissues) and carry out most chemical reactions in cells (such as converting food into energy or light into sight). 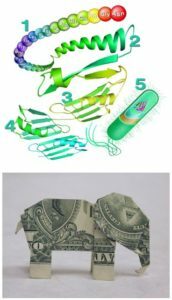 For a long time it was thought that proteins only function once they have “folded” into a highly-ordered shape, similar to how a flat sheet of paper folds into a smile-inducing origami elephant. The unique shape of a protein is dictated by chemical interactions between the amino acids that make up the protein as well as interactions between the protein and water. When drastic changes take place in the environment of the protein (i.e. during cellular stresses such as extreme heat, dehydration, or acidification), these important interactions are disrupted, which can cause proteins that are usually well-folded to temporarily unfold and become inactive. If such a protein remains unfolded for too long, temporary inactivity can become permanent as the protein becomes tangled up with other unfolded proteins in a process known as irreversible aggregation. Under extremely stressful conditions, a significant portion of the proteins in a cell can unfold and irreversibly aggregate, ultimately leading to cell death. 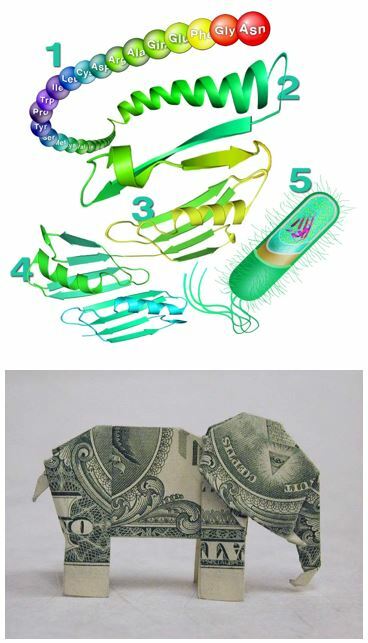 So let’s keep all our proteins nicely folded, shall we? Not so fast! In the past twenty years, the idea that a protein must be folded to function has been challenged by an up-and-coming group of proteins known as intrinsically disordered proteins (IDPs). As the name suggests, IDPs are defined by a distinct lack of a stable, well-folded structure, much like a single strand of spaghetti in a pot of water. This cat knows spaghetti makes you feel better when you’re stressed out. Interestingly, organisms across all domains of life have been shown to use IDPs to deal with environmental stresses. Many of these stress-response IDPs are “conditionally disordered”, meaning they can transition into or out of a more ordered state in response to an environmental cue. Given that IDPs are used to being in an unfolded-like state, it kind of makes sense that they can “survive” many of the environmental stresses that typically well-folded proteins can’t. But besides persisting through stressful times, how do IDPs help cells survive extreme environmental stresses? One emerging hypothesis is that stress-response IDPs work by morphing into a shape that can stick to partially unfolded proteins before irreversible aggregation can occur, thus making it possible for stress-sensitive proteins to refold after the stress goes away. In support of this idea, recent studies showed that the bacterial acid-sensing protein HdeA becomes disordered in acidic conditions, and it is in this disordered state that it can stick to partially unfolded proteins and prevent aggregation. Similar modes of action have been proposed for IDPs involved in heat- and dehydration-response as well. So, just like you in the hypothetical scenario described at the beginning of this post, some IDPs keep the group project (the life of the cell) on track by pulling aside the easily stressed out group members (highly-ordered, stress-sensitive proteins) and calming them down a bit so that once the stress has subsided, everyone in the group can refold and get back to work. Peer edited by Giehae Choi. The electron microscope (EM) was first tested by Max Knoll and Ernst Ruska at the Berlin Technische Hochschule in 1931, remarkably overcoming the resolution limits of visible light for the first time. 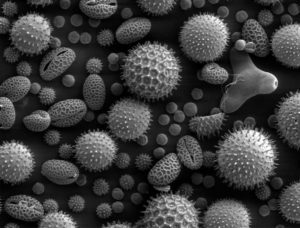 Modern electron microscopes can magnify objects up to 10 million times their size, and have been used extensively to visualize the inner workings of cells. However, biological imaging by electron microscopy (EM) is usually limited to producing grayscale images since its invention. 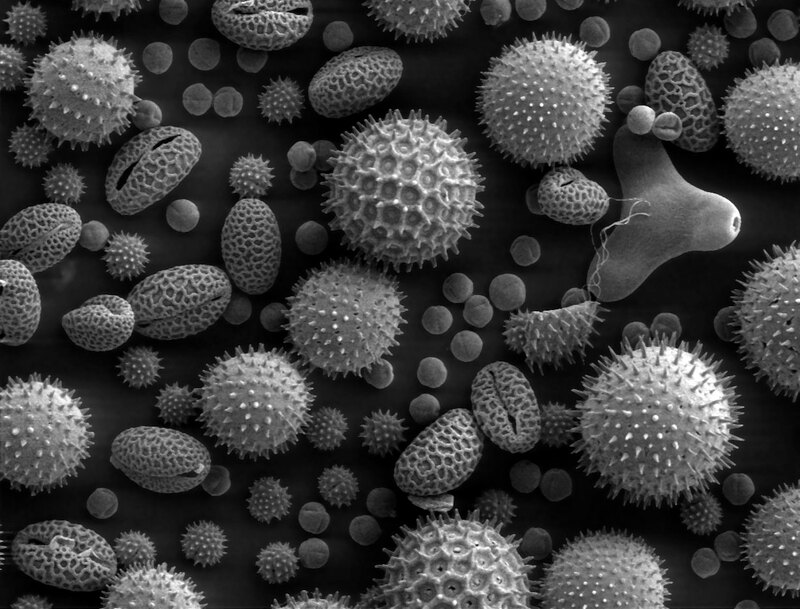 Electron microscopes used to only produce grayscale images. In the past 15 years, material scientists have developed methods of visualizing colored EM images, but their utility has been limited to imaging synthetic matter. However, a recent study, published in Cell Chemical Biology, has demonstrated a new method to bring super-high resolution colored imaging to the study of biology. The technique uses a special stain made from two rare earth metals, which label the molecules in cells on a microscope slide. When an electron beam is applied to the slide, the majority of electrons pass easily through the sample. However, some electrons that encounter the rare earth metal atoms lose energy, and these low-energy electrons can be detected by a filter on the microscope. Each of the two metals produces a different color. By overlaying the images of the cells before and after labeling, scientists can now create colored images to see details not visible in black and white images. The study paves the way for scientists to visualize how drugs are delivered to cells, and also how proteins travel within the cell. The developers intend to add additional layers of metals, enabling the colorization of more molecules. By increasing the number of detectable colors, this technique could be used to study even more complex biological processes. Peer edited by Chiungwei Huang. 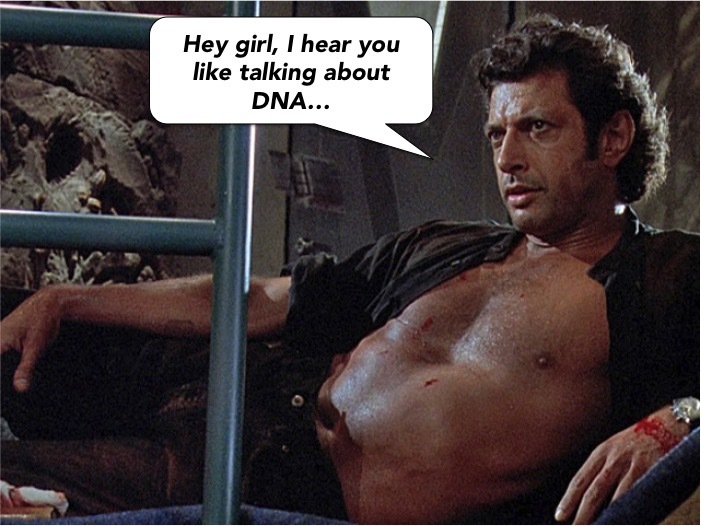 If you haven’t seen the cinematic masterpiece that is Jurassic Park, drop what you’re doing and go watch it now. Even if you don’t dig dinosaurs, there’s an immaculate scene of an injured, bare-chested Jeff Goldblum, and that alone is worth your 2 hours and 7 minutes. Forget dinosaurs, we need some clones of this guy.